Home / News / Duterte blasts Aquino: "Subukan mong pumasok sa shabu, pupugutan kita ng ulo"
Duterte blasts Aquino: "Subukan mong pumasok sa shabu, pupugutan kita ng ulo"
President Rodrigo Duterte blasted Benigno ‘Noynoy’ Aquino III after the former President said that no one happened in the war on drugs of the current administration. During his speech at the 113th Anniversary celebration of Bureau of Internal Revenue in Diliman Quezon City, the tough talking President threatens to behead his predecessor if Aquino tries to enter illegal drugs business. “Wala bang nangyari? Sige subukan mong pumasok sa droga, kung di kita pugutan ng ulo..” President Rodrigo Duterte said. The President also mentioned the 5 narco generals who allied themselves to former President Aquino and defeated Presidential candidate Mar Roxas. The names of the five generals are retired Deputy Director Gen. Marcelo Garbo; retired Chief Supt. and now Daanbantayan, Cebu Mayor Vicente Loot; Police Director Joel Pagdilao; and Chief Superintendents Edgardo Tinio and Bernardo Diaz. He even labeled Mayor Vicente Loot as the biggest of the narco generals. However, the five generals denied the allegations of President Duterte. Duterte also teased the former President, saying that Aquino never delivered an impromptu speech. 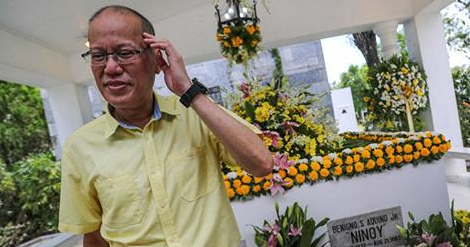 In an interview, former President Noynoy Aquino questioned the effectiveness of the war on illegal drugs launched by the current administration. He also said that despite of not launching war on drugs, Aquino boasted that his administration was abled to reduce illegal drugs user during his time. “Parang wala yatang nangyari.” Aquino said while talking about the war on drugs of the current administration. Aquino also questioned the bloody raid happened in Ozamiz City last Saturday where 16 people were killed including Mayor Aldong Parojinog. “Comments like the above from past leaders imply a jaded cynicism borne of a history of political opportunism,” the palace spokesperson Ernesto Abella said. “One, the Duterte administration’s anti-drug campaign resulted in the unprecedented voluntary surrender of more than 1.3 million drug personalities,” he said. “Two, 96, 703 drug personalities have been arrested in the first year of the present administration’s anti-drug campaign compared to 77,810 drug personalities arrested in the six years of the previous administration,” he added.